Labriola’s homemade Italian Wedding Soup has been a customer favorite for decades, and now we’re working hard in our kitchens to come up with fresh, new soup recipes for your culinary pleasure. 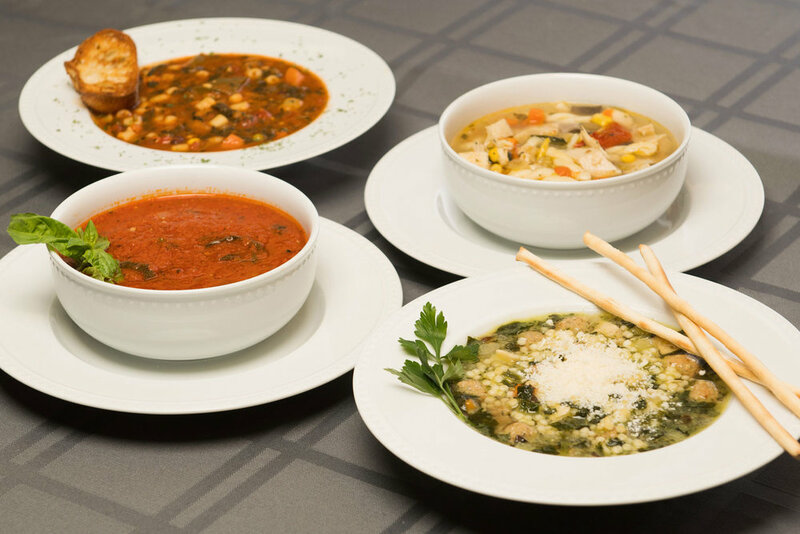 All of our soups are freshly made by our chefs with high quality ingredients and are the perfect first course for a dinner party, or easy weeknight meal. Minced steak fillet mixed with chopped vegetables and pearl barely seasoning cooked in a rich beef stock base. Minced steak fillet blended with corn, carrots and beans cooked in a rich beef stock base. Freshly cut chicken, extra wide soup noodles, corn, carrots, celery, and seasoning cooked in a rich chicken stock base. Caramelized onions in a rich chicken stock mixed with herbs and spices cooked to perfection. An old classic! Fresh escarole, cannellini beans, garlic, red pepper, spice and olive oil. Tomatoes, onions, carrots, celery, chicken stock, basil, herbs, spices, and flour cooked to a full-bodied soup. Potatoes, fresh leeks, onions, celery, spices, chicken stock, flour, and cream cooked to a rich volute. Lentils, Labriola's Italian sausage, tomatoes, assorted vegetables cooked in a rich chicken stock. Lentils, tomatoes, assorted vegetables, and spices cooked in a rich vegetable stock. Lobster meat cooked in a cream lobster base with allergen flour used as thickening agent. A thick vegetable soup with fresh herbs, beans, tubetti pasta, and cheese. A thick chowder made from clams, potatoes, onions with milk and heavy cream. A rich tomato sauce based soup with cannelini beans and tubetti noodles. It provides a great vegetarian option. Filled to the top with peppers and grade A beef and seasonings. Simmered to provide a smooth chili-like soup. Tomatoes, assorted vegetables, spices, flour, wine, chicken stock, finished with cream until velvety smooth. An Italian classic and neighborhood favorite. Celery, carrots, onions, meatballs, pastina. Made fresh daily. *Soup offerings may vary by location. Our deli crafts fresh, custom sandwiches daily, featuring a variety of flavors and styles. Place an order online for pickup in store.